Okay I admit, I’m a little crazy about dips. Eric and I joke that we’re the opposite when it comes to dipping things. I like to pile the dip on; to me the chip, cracker, dumpling or vegetable is just a medium for the dip. But sometimes when I’m feeding Eric crackers and dip on a car trip he says, “Too much dip, I need more cracker!” For him the dipping implement is the base for a light accompaniment of whatever tasty dip is featured that day. I wanted some easy comfort food the other day, and had a little bit of leftover ground chorizo in the freezer. 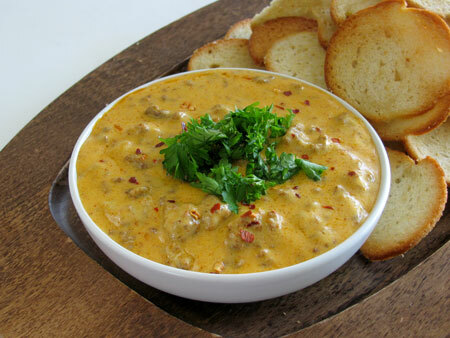 I thawed it out and starting mixing things to make something with three factors that add up to comfort food – cheese, sausage and dipping. I divided it into equal amounts in separate bowls for Eric and I and determined something interesting. In the end, we eat the same amount of dip, I just have less crackers! On another note, we’ve been getting a lot of visitors lately. I was outside napping in a lawn chair because of the blessing that my first day off in four weeks coincided with one of our few days of sunshine! Some strange crunching noises woke me and at first I thought that more branches were falling off of our poor diseased apple tree. When I opened my eyes, there was this fuzzy guy looking down at me. 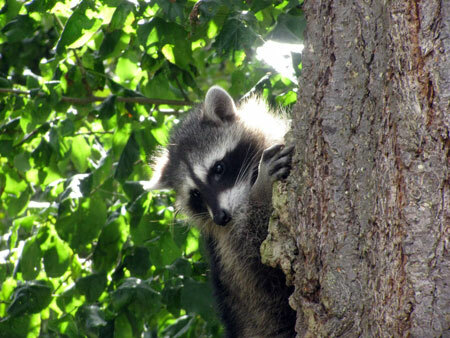 I jumped up and quickly assessed that there were not one, not two, but FIVE raccoons climbing around our trees…in broad daylight! Three of them were babies like this cute little guy, the other two were full grown. As you can see in the photos, they were absolutely adorable. In fact the babies looked quite cuddly! I get excited about animals like raccoons that we don’t have in Hawaii, but I’ve heard enough stories to know that raccoons are not in fact cuddly. After taking a million photos, I ran inside to google animal control in our area. I discovered that it’s provided by the county, not the city, and only for dangerous animals that are threatening humans. 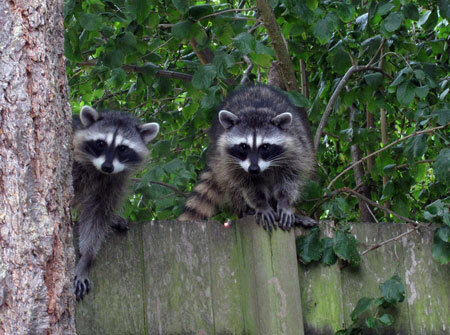 Their advice for raccoon problems is to latch garbage cans and not leave food outdoors. That’s a little hard when we have trees filled with apples, plums and (I think) hazelnuts. 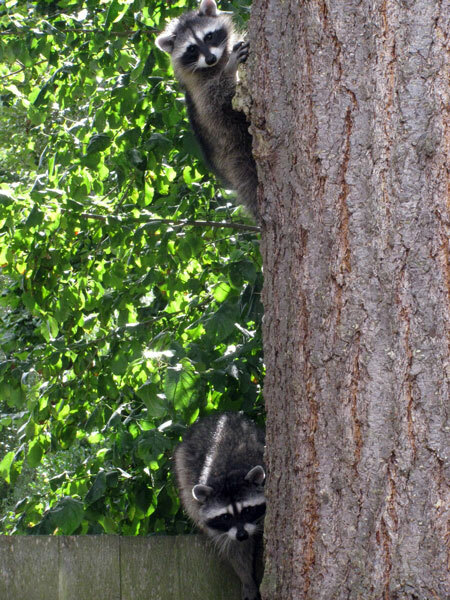 Even if they’re bug ridden this year and we can’t eat them, the raccoons didn’t seem to mind. I wasn’t too worried about our safety, but our cat Cappuccino is de-clawed (not by us, we found him abandoned as a stray with no front claws). He already got a nasty wound on his throat that abscessed and just healed up. I did not want to risk these raccoons getting comfortable in our yard and making it unsafe for him to go out. 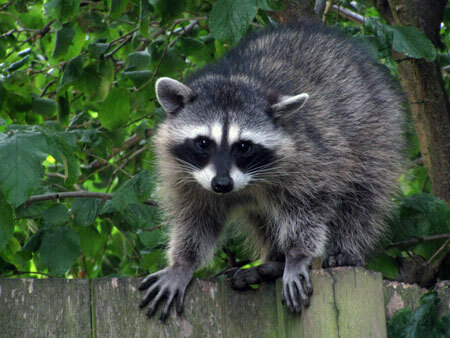 I tried grabbing a rake and beating the tree and fence to scare them off shouting “Get out of here raccoons!! !” No look, they just stared at me like I was crazy and made purring noises. Next I grabbed the hose, thankful I had previously attached two hoses together to be able to reach all the way to the back of our yard. I held the nozzle at arms length, got the biggest raccoon in my sights, and squeezed. I’ve never seen a raccoon move so fast! They scampered across the fence and ran up the tree of the house behind us. 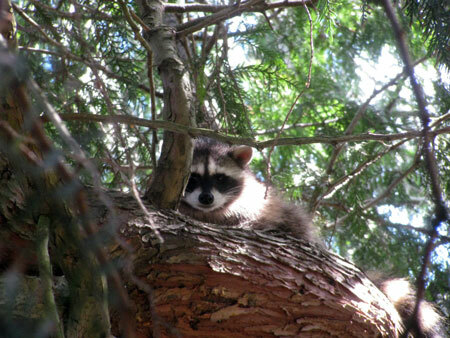 One poor baby raccoon got separated and stuck up in our tree. As he shivered in fear on the tree I tried to decide the best way to reconnect him with his family. I discovered that he wouldn’t move while I was spraying at him or even if I stopped spraying. But if I sprayed right above him he’d start scrambling down toward the fence. 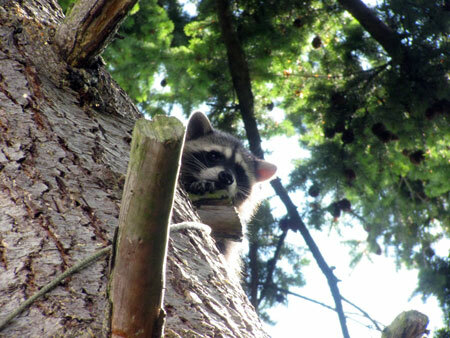 He finally joined up with his clan and our trees were raccoon free. It actually took an hour to get them all out! At the end of that experience was when I decided I needed comfort food. 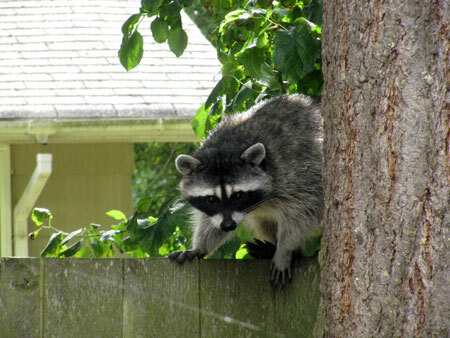 I love animals and hated scaring the raccoons to get them to leave, even if it was a human method of getting rid of them. 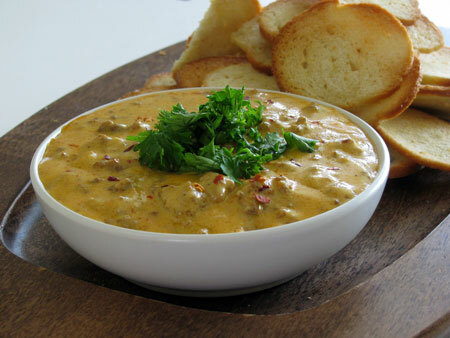 The dip hit the spot and its cheesy sausage goodness gave me the warm fuzzies by the time I finished it. You don’t have to save this for yourself though, it’s perfect for a party or small gathering! By the way, if you’re as crazy about dip as I am, here’s some of my favorite dipping recipes like Chinese Plum Sauce, Hummus, Salmon Dip, Peanut Sauce, and Buffalo Chicken Dip. In a large skillet cook the chorizo on medium heat until browned. Drain the fat off, or use paper towels to blot it up. Pour half and half and milk into the skillet and return skillet to low heat. When warm, add sour cream and cheddar to skillet. Stir continuously until cheese is melted. Stir in crushed red pepper. Sprinkle the dip with crushed red pepper and cilantro and serve as a dip for chips or crackers, or pour over chips to make nachos. Oh my gosh! I don’t know what I would have done if I was being stared at by raccoons. They sure are cute in your photos, but yikes. And that they were out in daylight would have made me even more scared. I suppose I would have calmed myself by saying all FIVE were not rabid, but still, the fact that they were out and about in daylight would have really freaked me. I love the photos and the dip looks scrumptious and I’m happy to live 14 stories up where a lone Praying Mantis is the big news up here. 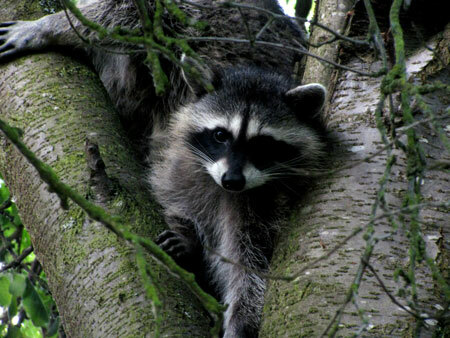 Love the pics of the raccoons. Your dip sounds incredible. It really would make the perfect plate of nachos. 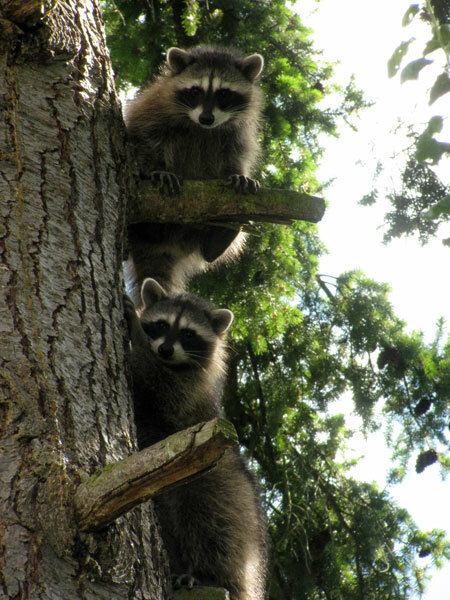 Raccoons are very photogenic, but you might want to think of them as “Climbing Badgers”. We lost 4 cats last year to raccoons.